Pistachio Green Tea Chia Pudding is the first thing I’ve tried with the matcha green tea powder. An amazingly nutritious vegan pudding sweetened with a little brown sugar. This is a perfect healthy pudding you can have when you crave for something sweet for breakfast or as a snack. After seeing thousands of green tea recipes around the web and learning that it’s a wonderful source of antioxidants, I felt like I had to find this naturally beautiful green powder and try something with it. I had searched for it for a long time but couldn’t find it in Turkey, so I gave up. Then I discovered a new company last week that brings green tea powder matcha to the country. They even give a nice Turkish name to this healthy tea, “neşe cayi” meaning tea of good spirits. Many thanks to this Turkish company named Aradolu for providing us with this superfood! You can imagine my excitement when I first got it in my hands. There were several green tea recipes in my mind and although I was so intrigued by Nami’s Green Tea Chocolate on her lovely blog Just One Cookbook, where you can find several other inspiring green tea recipes, I knew my first recipe would be a healthy one. Knowing that our Raspberry Coconut Chia Pudding is a favorite recipe of our readers, I decided to make matcha green tea chia pudding. To be honest, the powder I finally found here is not as green as I expected. I learnt that it might depend on the brands. As I have only one choice for now, I need to find ways to make my green tea recipes look greener. That’s how this Pistachio Green Tea Chia Pudding came out. Adding pistachio powder both in the pudding and on its top definitely helps the color get brighter. It gives a nice nutty flavor to the pudding as well. What’s more, the pudding becomes even healthier thanks to it. I made this pistachio green tea chia pudding with Homemade Almond Milk, but you can use any plant based milk to make it vegan like coconut milk or soy milk. If you are not vagan though, you can use cow milk or goat milk too. I think a pudding must be sweet, so I used brown sugar. The amount is up to your taste, so you can play with the measurement of sugar in the recipe. If you don’t want to use sugar, you can replace it with maple syrup as the sweetener. Or honey if you are not vegan. So how was the result? Okay I’m not going to lie. 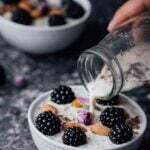 You might remember our first feelings about chia seeds in a puddings if you’ve read our raspberry coconut chia pudding post. Well, it hasn’t changed. These seeds look like frog eggs! My feeling got even stronger when I saw the seeds in a green pudding. However, it’s no longer strange to me as I’ve been making chia seed pudding recipes for almost a year now. But be prepared for this feeling if it’s the first time for you. Unlike its unusual look, this pistachio green tea chia pudding tastes so good! It’s smiliar to a regular almond milk chia pudding with subtle green tea and pistachio flavors. I must warn you though about the amount of green tea powder. If you use more than one teaspoon, you end up with a grassy flavor in your pudding. So add it gradually if you are considering to increase the amount. 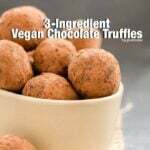 If you are open to new tastes or in search for healthy sweet treats, give this recipe a try. And feel free to share your opinions in the comments section. Chia pudding colored with green tea powder and flavored with pistachio and brown sugar. A perfect breakfast or dessert with superfoods! In a glass jar, combine all ingredients. Cover it with its lid and store in refrigerator overnight or at least 5 hours, shaking it a few times within this time. Give it a good stir or just shake the jar well before serving. 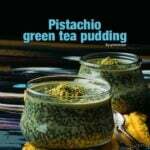 Share into cups and top each with pistachio powder when serving. Overnight chilling time is not included. Yum! I love chia puddings and have them for breakfast topped with fruits and seeds sometimes. Thanks for the new inspiration! Thank you Joy for the comment! Chia puddings make a perfect breakfast, don’t they? Although it took some time for me to get used to its look, I love to try new pudding recipes with it.